Two of our graphic designers ended up in the universe of marketing and PR. Straying from the conventional path of university at 18. 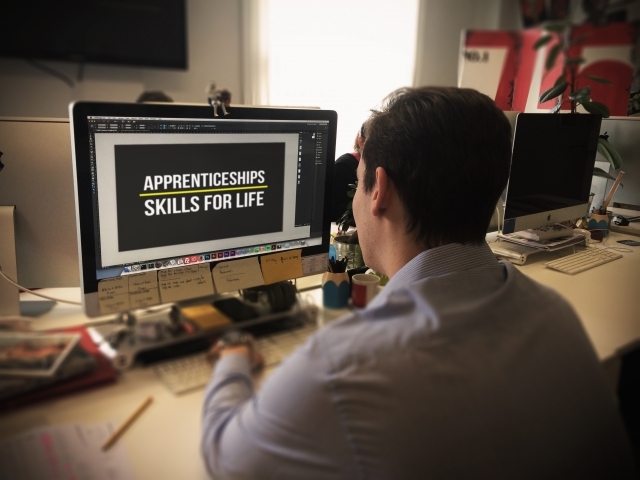 To ‘rocket’ their way to a great deal of new skills and experience through the apprenticeship scheme here at Rocket Creative. Michael is currently on the scheme, which began in September of last year. He was previously doing A-levels at sixth form, but decided to forego university for the moment, and take up an apprenticeship. I asked him about how he was finding it, and what made him choose it in the first place. How long have you been on this apprenticeship, and what have you learnt in this time? I started this apprenticeship in September of 2015. During my time being here I have learnt so much! I’ve learnt how to get around all the programs that are used in the industry, and I still have so much more to learn. What were you doing before this? Did you know that you wanted to begin an apprenticeship early on? Before this I was at sixth form doing my A-levels. Originally I wanted to go to university straight away, but slowly came to the realisation that I could still do well if I didn’t go. I looked around at things to do in the field I was interested in and decided to do an apprenticeship. What are your plans after your apprenticeship finishes? Are you not going to go to university then? After my apprenticeship my plans are to do a marketing course at university, with the ideal scenario being if Rocket took me on after my apprenticeship (hopefully!). Then allowing me to do the uni course part time. How do you balance college work and your apprenticeship? I balance the work from college rather well, it sounds simple but in my free time I get the college stuff done, and in the day while I’m at work, I work. How did you find this apprenticeship and what was applying for it like? I found this apprenticeship by talking to my careers lady at school. She was helpful, but not many places in Northampton do a design apprenticeship, so it was a bit hard to find the one I wanted. How much support and training have you (and do you) receive day to day? I receive help everyday and anyone is happy to help me if I need it. If I don’t know how to do something someone will walk me through it until I understand how to do it for the future. Give a brief outline of your experience up to now. My experience of the apprenticeship has been amazing as of yet! I’ve met some really nice people and I’ve learnt a lot, which will definitely aid me in the future. Every day I come to work is enjoyable.